We want to show everyone that vision therapy centers around the world are achieving success. To demonstrate the efficacy of vision therapy, we created this webpage of links to the success stories published by other vision therapy centers. We’ve been asked that question since The Vision Therapy Center opened in 1995. We’ve answered by helping thousands of people improve their functional vision and change their lives. And we know we’re not alone. We’ve documented many of our success stories on our website, but we know other developmental optometrists around the country have done this as well. So we thought if we could build a page where we linked to all the success story webpages across the countries, it would demonstrate to patients, educators, and other medical practitioners how effective vision therapy can be in helping children and adults struggling with functional vision problems. Below you’ll find a list of vision therapy success pages - including some noteworthy individual success stories. We’d love to link to yours as well. If you would like to include your vision therapy success story page in the listing, please click here and send us your clinic’s name, your address, and a link to your page. We strongly encourage you to add a link to this page from your website, so all prospective patients can see the other success stories around the nation! If you’re worried about putting your success stories up next to another clinic that provides vision therapy, don’t. One in four children has a vision problem that affects their ability to learn. Our biggest problem isn’t a lack of patients; it’s a lack of awareness. Besides, showing how many developmental optometrists practice vision therapy underscores how widespread vision therapy truly is. It shows that vision therapy, which is part of every optometrist’s medical training, is a valid and effective method for correcting vision problems. Naturally, we’ll start off with our own success stories. We’ve compiled a montage of videos, stories we’ve written, and stories written by our patients. Austin Eye Gym specializes in diagnostic, therapeutic & enhancement services to habilitate, rehabilitate or enhance Neuro-Visual Function. They have a lengthy page of testimonials. Dr. Jen Simonson helps her patients reach the goal of a functioning visual system, which can make "earning and learning much successful!" Dr. Nate Bonilla-Warford and Dr. Elizabeth Knighton provide vision therapy at Bright Eyes Family Vision Care. Their success stories pages include testimonials from kids and parents. The “Vision Visionary,” Dr. Hellerstein is a pioneer in vision therapy and developmental optometry, as well as an award-winning author. Her success stories include testimonials from parents, teachers and fellow professionals. Dr. Suter’s team offers comprehensive vision care and vision therapy. 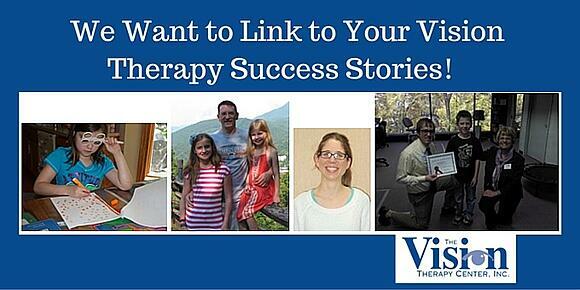 Check out their vision therapy success stories. Dr. David and Dr. Carlyle provide vision therapy and low vision services, as well as sports vision training. They have a variety of success stories written by their patients and parents. Dr. Rosalyn Coleman's practice Envision Therapy specializes only in vision therapy, neuro-rehabilitation, and ortho-k. They are located in Woodstock, GA. Their success stories include written and video testimonials. A vision therapy clinic run by Dr. Leanna Dudley, OD, FCOVD, a developmental optometrist specializing in pediatric optometry, vision therapy, and rehabilitation. Check out their success stories - each handwritten by kids! Hope Clinic designs a vision therapy program to incrementally build upon your current visual skills, helping you achieve and excel to your highest potential. Their success stories include testimonials written by patients and videos. Jillian Benoit and her mother, Robin Benoit, were so amazed by Jillian's life-changing success with vision therapy that they embarked on a goal of spreading the word about it to others. This link is to their website and the two books they’ve written about their amazing journey. Helps patients of all ages through vision therapy, low vision rehabilitation and neuro-optometry. Testimonials from patients and parents. Dr. Eliot Kaplan is active in the community, providing vision education for teachers and parents, while offering “vision screenings” for local schools and summer camps. His success stories include pictures and notes from patients and parents. PRI Vision integrates the professions of physical therapy and behaviorial/neuro-optometry, courtesy of Dr. Heidi Wise OD, COVD. Check out testimonials to their innovative approach. PressVision is the website for Vision and Learning Center of Family Eyecare Associates, established in 1985 by Dr. Leonard Press. Their site includes success stories and videos. The developmental optometrists of the OCVT have a testimonial page with pictures of their graduates and patient-written success stories. Dr. Jarrod Davies and his team provides area residents with comprehensive eye care and vision therapy solutions for both adults and children. In-depth success stories written by parents. Dr. Brad Habermehl’s vision therapy practice has been helping children since the early 2000s. His testimonials page includes pictures from happy grads! Dr. Joan Baurenfiend's Vision Development Center is a unique vision care provider specializing in the diagnosis and treatment of functional vision disorders. Dr. Pelton and Dr. Poma provide vision therapy services in the metro-Detroit area. Success stories from patients and parents, including pictures and a video! Dr. Tanya Polec’s team provides vision therapy, visual rehabilitation, and sports vision therapy. Her testimonial page includes patients in each area. Dr. Ben Winters’ practice has a great vision therapy success story page, with photos alongside each success story. Not on Here? Let Us Know - We’ll Keep Adding to the List! We know we’ve just scratched the surface with our listing. Please share this listing with other developmental optometrists, and let us know if you’d like to be added to the list. Whenever we add a new clinic, we’ll tweet out the update! To submit your entry, just email Greg Mischio your clinic name, a short description (like the ones above) and a link to your success story page. Let’s spread the word about vision therapy!